Ni sa Bula Vinaka, Namaste, Asalaam Alaykum, Ni Hao, Noaia ‘e Mauri, and a very Good morning to you all. Two years ago next Saturday, we launched our new democracy, when the Fijian people cast their votes in the general election of 17 September, 2014 – the first to be based on the genuine democratic principle of equal votes of equal value. As we come together today to officially open the 2016 Session of the Parliament, we have reached the midpoint of the current four-year term. And the Fijian Elections Office is already well advanced in its preparations for the next election in 2018. At this halfway mark – the equivalent of half time in a rugby or football match – it is appropriate for me as your Head of State to not only outline the Government’s legislative programme for the coming year but for all of us to take stock of our performance so far; to review the progress we have made as a Parliament and as a nation over the past two years; and to reflect on ways in which we can improve our quality of service to the Fijian people. Because it is to them that we owe our allegiance as Members of Parliament, and in my case, as President. And whose interests we have solemnly sworn to uphold. It has been a very difficult and traumatic time for a great many Fijians in the six months since Tropical Cyclone Winston slammed into our islands and claimed the lives of 44 of our loved ones. As you all know, Winston also left many thousands of people homeless and destroyed schools and other public infrastructure. My Government’s huge relief effort and the provision of urgently needed food supplies and shelter was quickly implemented. And as you all know, it embarked on two principal initiatives – based on need and through a transparent process – to rebuild our country – The Help for Homes and Adopt a School programmes. The challenge before us as a nation is the sheer scale of the disaster and the consequent shortages of basic materials needed for the rebuilding effort. These items are being obtained from overseas in cases where local suppliers are unable to meet the enormous demand. And to make it easier to import these supplies, the Government has zero-rated duty on these basic building materials. As you all know, we could not have coped with the scale of this disaster without the assistance of our many friends in the international community – governments, organisations and individuals. And I again ask the members of the Diplomatic Corps who are present here today to convey our heartfelt thanks for that assistance to your governments and your peoples. We are privileged to have a group of French Senators with us here today who are specifically tasked with building friendships in the Pacific. So I especially ask you – Honourable Senators – to convey our thanks to the French people for their response to the needs of our people in the form of a surveillance aircraft, a naval patrol vessel and relief supplies. We are all grateful to France for its generosity and kindness. I also thank you for your generous offer to host – in Paris – the winners of our national essay competition on the Constitution, which will be announced on Fiji Day. Your fundamental national values of Liberty, Equality and Fraternity, are values that we also cherish. And we can learn a lot from your 230 years of democracy. Madam Speaker, The Honourable Chief Justice, the Honourable Prime Minister, Honourable Cabinet Ministers, the Honourable Leader of the Opposition, Honourable Members of Parliament, Excellencies, Ladies and Gentlemen. However much of a blow Tropical Cyclone Winston was to Fiji, we were extremely fortunate that it spared our main tourism areas and the principal source of our national income. Our international visitors kept coming and – in some instances – in even greater numbers. So our overall economy has proved to be remarkably resilient. And we are still expecting it to grow by close to 3 per cent this financial year. It has been truly a bitter-sweet year – the bitter impact and legacy of Winston – coupled with one of the sweetest moments in Fijian history that none of us who witnessed it will ever forget. The Olympic Gold that our Rugby Sevens team brought back from Rio de Janeiro has had a profound effect on the national psyche. They have brought Fijians together in a way we could never have imagined. And they have triggered a surge of national pride and patriotism that has been shared by every Fijian. It is cause for great celebration that we can begin this parliamentary session knowing that as a nation, we have never been so united as we have been in the past month. To outsiders, it may seem strange that winning a rugby match can have such a profound effect on an entire nation. That the joy of rugby fans can be so infectious that it spreads into every corner of national life. But it is no surprise to any Fijian. Because not only is rugby a national obsession, we play Sevens Rugby better than anyone else on the planet. Back to back world champions as well as taking Olympic Gold. The Sevens global superpower. As much as the astonishing achievement itself, it is the symbolism of our Olympic win that has gripped the imaginations of our citizens and especially our young people. It is the growing realisation that coming from a small nation with limited resources is no impediment to success. That if we put our minds to it and work hard and work with the best, Fijians can do almost anything. It has shown us that we can journey forth from our island homes fired with the Fijian spirit and be world beaters. Not just on the rugby field, but in everything else we do as a nation. Whether it is the quality of our exports and the Fijian Made brand; the proud reputation of our national airline; our respected men and women in uniform keeping the peace in troubled parts of the world; or the disproportionate lead we are taking in drawing global attention to the urgent need to confront the challenges of climate change. The nation calls on you to do all you can to harness the spirit of our Olympic win. To tap the wonderful sense of unity that has descended on our beloved Fiji. To leave aside petty squabbles, rivalries, division and grandstanding for personal and political gain. To use this Parliament as a force to propel us forward to the greatness we glimpsed in Rio. And which with Almighty God’s help, will be our nation’s future. Even without our Olympic win, we would have entered this new session of Parliament with a sense of optimism that Winston couldn’t crush. We have had seven straight years of economic expansion – the longest running period of growth in Fiji’s history. My Government’s prudent economic management is acknowledged by Fiji’s development partners and global financial institutions. And they are eager to help us take our nation to the next level, on the steady path that the Government has set to become a modern nation state. My Government is responsibly using the increasing financial resources available to it and the revenue it is generating from economic growth to transform our nation’s prospects. It is investing hundreds of millions of dollars a year in new infrastructure projects. Because these are the building blocks of economic resilience and growth. First and foremost in my Government’s mind is to empower more of our young people through its education revolution. This includes free schooling and more scholarships and tertiary loans, plus access to affordable transport to attend these institutions. The Government has created a national network of technical colleges to complement our universities. And to teach our young people the trades every nation needs to maintain a proper skills base. We are determined to provide young Fijians with every opportunity to have prosperous and satisfying futures. My Government is improving access to such necessities as healthcare and legal services, and connecting more people to, electricity, water and telecommunications. It is attracting ever increasing levels of investment – foreign and local – and creating jobs with a range of incentives and some of the lowest corporate and personal taxes in the region. And it is igniting an enterprise culture in Fiji by assisting our people with its Small and Micro Business Grants to start their own businesses or expand existing ones. The Government has given an undertaking to create a national body to coordinate this effort and make it more streamlined. Most important of all for anyone who values an inclusive society, my Government is using our increasing prosperity to benefit the disadvantaged and take every Fijian on our journey forward. It has introduced the first social security pensions in our nation’s history. And lowered the age at which the elderly become eligible – from 70 to 66 in the past two years. The Government is providing free medicine and water, plus subsidised electricity for low-income earners. Along with a range of specific programmes to assist the most vulnerable members of society – women, children, the elderly, the sick and the disabled. It was a wonderful privilege for me as President – at our first Constitution Day celebration last Wednesday – to hear Naomi Lewakita from the Fiji School for the Blind read out the Rights of the Disabled from the braille version of the Constitution. It was easily the most inspiring moment of a very inspiring day. So much so that I have asked Naomi to be with us in the Chamber today. And to receive the acclaim she so richly deserves for making us all so very proud. Naomi, would you please stand to be acknowledged by our elected representatives and distinguished guests. It is also my duty today – as Head of State – to outline my Government’s legislative programme for the coming session. Once again, it continues its programme of modernisation and reform and opens up new avenues of investment and opportunity. All to support the Government’s overall vision of Fiji taking a pre-eminent role in our own region and strengthening our voice and presence in the world. Quarantine; patents; industrial designs; trademarks; traditional knowledge and cultural expression; public health protection; secured transactions; pensions saving; the subdivision of land; town planning; elections; credit unions; electronic transactions; the transplantation of human organs; anti-doping laws; the registration of practicing engineers; and residential tenancy. The review of legislation includes: The Public Order Act; the Police Act; the Arbitration Act; the Housing Act; the Public Enterprises Act; the Stamp Duties Act; the Land Transport Act; the Consumer Credit Act; the Sale of Goods Act; the Bankruptcy Act; And the Customs Tariff Act. The Parliament will also be asked to review the United Nations Electronic Communications Convention for ratification. This is my first official opening of the Parliament since I assumed the role of President and I am aware that I have got some very big shoes to fill. As you all know, my distinguished predecessor, His Excellency Ratu Epeli Nailatikau, had many qualities as President and one was the ability to speak plainly. So I want to close today by recalling what he said to you all a year ago – and to me as a Member of Parliament myself back then – when he addressed us from where I am now sitting. His Excellency Ratu Epeli asked us to promote unity rather than division. To think beyond parochial interests of ethnicity, religion, socio economic status or where we come from in Fiji. Not to peddle false information to create fear among ordinary people. Not to attempt to bring our highest offices of State into disrepute with crude smears. Or undermine the economy for political gain. “ I ask you all to put the honour back into honourable, in carrying out your duties as members of parliament. To raise the tone of the forthcoming session and to lead the nation by example” Unquote. These are words for the ages and apply to the conduct of any elected representative. And as I draw your attention to them again with my full endorsement as President, I want to add some of my own. Let us all be worthy in public life of the ordinary men and women who have put us here, have given us their trust and to whom we owe our ultimate duty. Our ultimate loyalty. We are now a nation that is unified. More so than at any time in our entire history. And we are a nation on the move. All around us are the signs of revival, of rejuvenation – whether it is the historic building in which we sit, the park outside with its new pavilion and grounds or the stately hotel that faces our beautiful harbour. 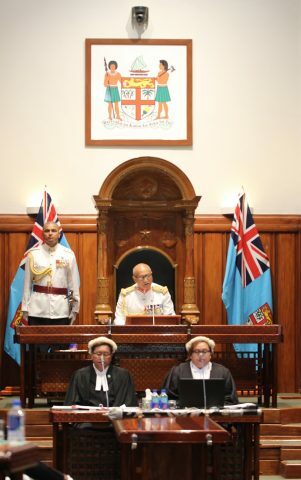 All these are within a short stroll of here and are all signs of a transformation that we must extend to other parts of Fiji and to every facet of our national life. Let us rededicate ourselves today to the task of continuing to rejuvenate our nation and giving it the sense of direction and purpose it deserves. Let us set an example in this Parliament for young Fijians, who look to us to build a future worthy of their dreams and aspirations. Because it is by setting a standard of excellence here that we can inspire them to excellence themselves. And be powerful role models in the quest to make Fiji great. It is now my honour to declare the 2016 Parliament session officially open. May Almighty God Bless you all. May God Bless Fiji. Vinaka Vakalevu, Sukria, Bahoot Dhanyavaad, Xie Xie, Fai’aksea and Thank you.